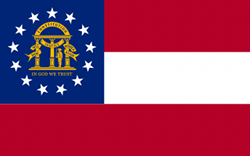 Starting with its beginnings as a colony in 1733 through modern day, the state of Georgia has a very rich history. To full appreciate the lives your ancestors lived, you must dive deep into the history of the Peach State. Understanding the state's involvement with groups or in events will not only help you identify record sets to explore but will also give you a richer history to share when compiling your family's story. The New Georgia Encyclopedia is a wonderful free online resource made available by the Georgia Humanities Council to help you learn more about the history of the state, including information about specific counties and neighborhoods. Georgia's Virtual Vault is the "portal to some of Georgia's most important historical documents, from 1733 to present," and it is most certainly an important tool for researchers in this region. You'll be able to locate birth, marriage, and death records; land records, such as deeds, surveys, and plat books; military records, such as enlistment oaths, discharges, and pension applications; and other resources, such as photographs and postcards. Although some Georgia counties began keeping records of vital events such as birth and marriage prior to 1800, vital records weren't mandated by the state until 1919. However, counties weren't in compliant in high numbers until the late 1920s. Marriage records were issued on a county level beginning in 1805. Information in marriage records varies from county to county. Historical records are held on the county level. Birth and death records can now be ordered through the Georgia Department of Public Health. The DPH also has copies of marriage licenses from 1952 to 1996. Mercer University's Tarver Library houses a large collection of materials related to Baptist churches and ministers in the state of Georgia. Located in Macon, access to this collection is free to the public. Included in the collection are biographies, association and convention records, church meeting minutes, and more. The Arthur J. Moore Methodist Museum and Library located on St. Simons Island is not only beautiful but also essential in your search for your Methodist ancestors. The library and archive holds materials from 1974 to present for the South Georgia Conference of the United Methodist Church as well as other biographies and genealogical materials related to families within the church in Georgia. For those with Roman Catholic ancestors, both the Archdiocese of Atlanta and the Diocese of Savannah maintain records such as births and baptisms, marriages, and deaths. If you make your way to Atlanta as part of your research, you'll discover four wonderful repositories all in close proximity. They will help you with your research no matter what area of the state your ancestors lived. As with any repository, be sure to familiarize yourself with their collections and rules before your visit. The Georgia State Archives is home to the oldest and most valued collection of state historical documents. Their collections include military records reaching back to Georgia's colonial days, historic maps and photographs, vital records, land and tax documents, and more. Located next to the Georgia State Archives is the National Archives at Atlanta (Southeast Region). This branch of the National Archives hosts records in both the reading room and microfilm room related to Georgia and its residents from X. Of specific interest to researches may be the African American history collection as well as the Native American collections in addition to the military records and non-population census schedules. The Special Collections at the Central Branch of the Atlanta-Fulton Public Library holds the Genealogy Collection but also the Georgia History Collection. If you are able to research in the area this collection should be on your to-do list. In addition to familiar indexes and county histories, you will find a vertical file collection for biographies and histories, a large historical map collection helpful for understanding the changing county boundaries, a large newspaper collection including smaller alternative papers associated with Atlanta history, and much more. Personally, I've found the staff to be extremely helpful to those of us who currently live outside of Georgia's borders. The Atlanta History Center is home to the Kenan Research Center. If you have Atlanta-based ancestors this is a must-use resource. It is also home to a large collection of materials related to the Civil War, regional history, cultural artifacts, and more. In fact, the military history collection should be on every researcher's wish list if you have a relative who was involved in Georgia's military past. Also in the collection is the Frank Garrett's Necrology microfilm collection. This set is searchable online and contains information on the deaths of white men aged 21 or older from 1857 - 1931. It isn't all inclusive of Atlanta's population, but records in this database include cemetery records and obituary abstracts. A complete list of finding aids will help you prepare for your trip. The Washington Memorial Library Genealogical and Historical Room in Macon boasts a large collection of materials in both book and microfilm form relating to the genealogy of the state. The flagship collection within the research room is the colonial collection. Not only will you find information on the Georgia colony but also on the other original colonies as well. What makes this repository special, in my opinion, is the newspaper collection. If you have an ancestor in this region of the state you are likely to find the newspaper that was published in the area if a copy was microfilmed. For those of us outside the region, the research staff has clear instructions for long-distance research assistance outlined on the library website. Generally speaking, the first war many think of when discussing Georgia is the Civil War (or, as many in the South call it, the War of Northern Aggression.) However, Georgia ancestors may show up in military rolls long before this event. Records may be scarce for this region, but don't rule out the possibility that you may find your ancestor in military records associated with conflicts with Native American tribes, the American Revolution, and events associated with the Indian Removal Act (1830). The advantage to performing research in some of the smaller towns in Georgia is that many families know of those who founded their town or county - and have relationships with those who still live in it. Georgia is known for its Southern hospitality. Say hello, remember your Southern graces, and make a personal connection with those you meet along the research trail. With a large dose of friendly conversation you may just find that it isn't a book or database that holds the key to your research success.